What does it mean to you that Mike's Automotive is a AAA Approved Auto Repair facility? The AAA (American Automobile Association) has millions of members nationwide. When those members ask AAA where they should go for auto repair, they refer them to a "AAA Approved Auto Repair" facility near the member. Not all auto repair shops are AAA Approved. In fact, fewer than 5% of all shops ever become a "AAA Approved Auto Repair" shop. To be approved the auto repair company must pass the AAA's very stringent requirements and inspections. Also, as a AAA member, you can show your card and save 5% off parts and labor! Just ask! Our shop must pass a rigorous and thorough investigation that takes a long time. We must pass all subsequent periodic inspections as well. We must have quality equipment to perform the services. Was the job done on time? Did they fix the vehicle right the first time? Did they offer a ride to work or wherever you needed to go? Was there a comfortable, pleasant and clean waiting area? If AAA trusts our company enough to send their very important members here, then you can too. They've done the hard investigative work to make sure we are a reputable and worthy shop. Then they continue to make sure we are with their periodic inspections and customer surveys. 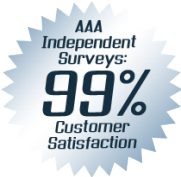 AAA's Independent Surveys of our customers give us a great ranking of 100% Customer Satisfaction. Each year, AAA surveys our customers to see how well we are providing care to our customers. They want to know if we were treated professionally, and if the quality of our auto repair and maintenance services was up to their standards. The results of their independent survey shows we have an amazingly high score of 99%. That score is very high for any company dealing with the public, but it is fantastic for an auto repair company. We have worked very hard to achieve this score. We are constantly working to achieve a score of 100%. How do we score so high with customer satisfaction? We care for our customers like their are our family. We continually strive to make care care more convenient for our customers. We hire some of the very best auto repair technicians and service advisors available. We are true professionals that strive to give each customer a quality experience and services that meet or exceed their expectations.